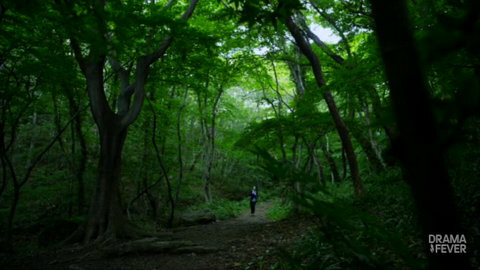 Samsoon Down the Rabbit Hole: Gaksital Episode 17: Musings et al. Gaksital Episode 17: Musings et al. So pretty much Gaksital is FANTASTIC!!! I love, love, love it!!! And episode 17 was just fantastic. Perhaps posting about it is my way of surviving the week on only two episodes *sigh*. 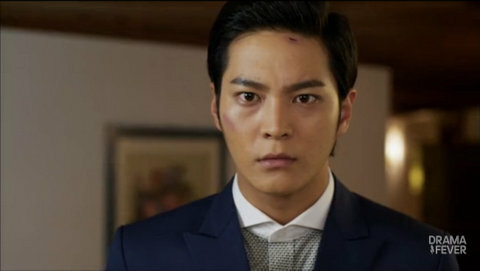 I think that for me that moment when Dam Sa Ri looks at Kang To after he's shot the Japanese police officer, was just lovely. Perhaps a weird description - but it was almost this fatherly look of desperate hope and wonder. I just love that Dam Sa Ri believes in Kang To - and he shows it. He doesn't even have to know that Kang To is Gaksital, he believes in the goodness of him as a Korean, and I would say as a human being - it's almost a father-son moment. I guess he is father figure in the sense of being his freedom fighter mentor - and it's really telling when Kang To sits (his posture really says a lot) with great respect before Dam Sa Ri, and then calls him "teacher" - it just made my heart melt with warmth and gladness! And it brought back memories of the episode 14 boulder and the egg conversation. Ah! I just love their dynamic right now. Sadly I am getting the vibe that Dam Sa Ri's days are numbered - do both Kang To and Mok Dan have to become complete orphans show? Speaking of Kang To and Mok Dan - their relationship is getting more and more interesting. I think the relationship between Kang To and Mok Dan is really interesting. They are both the children of freedom fighters who have lost most, if not all their families to the cause - and yet they chose such different paths that are now converging. Kang To's pragmatic pathway that lead to siding with the Japanese, and Mok Dan's fiery, idealistic fervour - pretty admirable fieriness for sure. Kang To's path at least has brought him to realize the horrors he committed. (I wonder if his hyung had actually let him be a part of it, if he would not have done all the evil things he did - though I guess we'll never know. His hyung, perhaps to save him pain, didn't tell him - and in a way showed he did not fully believe he was capable of bearing that burden). 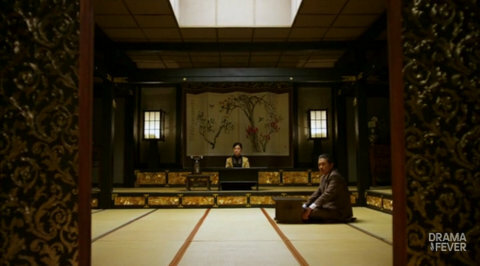 The scene in the hotel where Kang To tells Mok Dan that he is "the young master," the one who gave her the knife was just heartbreakingly beautiful! Wow! I think it was my favourite scene in this episode. Her disbelief was completely understandable - but I want her to believe him! His beseeching eyes were begging her to see the young boy that he was, the good, idealistic Kang To that is still there deep inside. I think it took a lot of courage for him to tell her - I think we all fear rejection of some sort when someone we care about deeply knows all our deepest, darkest secrets. I am glad that Dam Sa Ri can see that in him. Oh those eyes begging her: Mok Dan, please see me, please, please forgive me, please? Their relationship is nicely contrasted by the ever increasing poisonous interchanges between Shunji and Mok Dan. 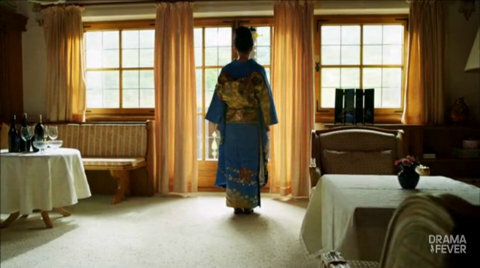 bustered and I have been having a conversation about it in fact: (on a side note, this drama has some exceptionally beautiful cinematography). 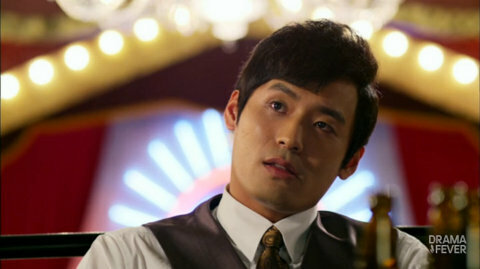 bustered: And how awesome was Shunji in this episode ? I cringe every time he gets near Mok Dan. And when he touches her, it makes my skin crawl. 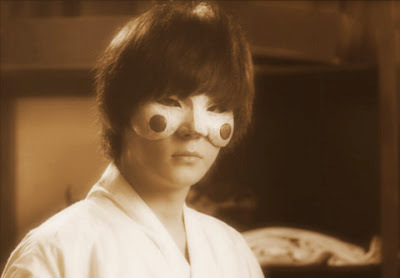 When Shunji smiled at the circus leader and treated him respectfully after torturing him, I had shivers. dewaanifordrama: I know! He just rocked him back and forth so nonchalantly. Ugh, shivers up and down my spine! I have equal parts revulsion and admiration for him - well I should say revulsion for Shunji, and the admiration for Park Ki Woong. That man is just, wow! No words to describe how fantastic he is. 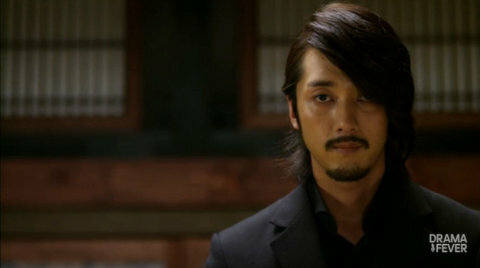 I worry though, will Shunji ever come back to the good side? 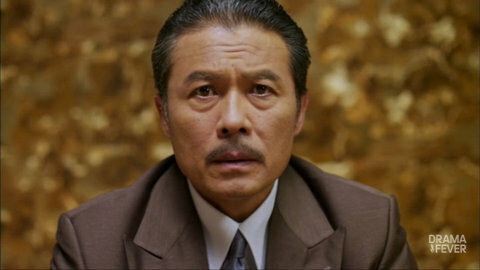 That scene in the hotel where he's playing good cop - just thinking about it I still get shivers. 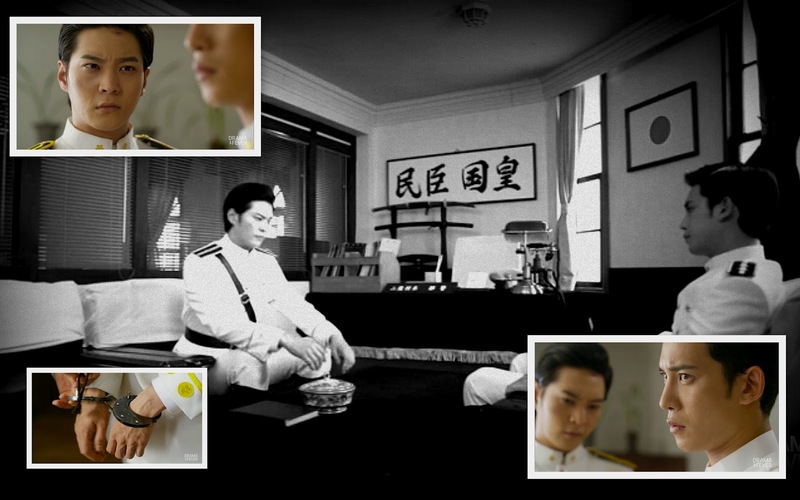 bustered: When Shunji moved to touch, I was like - Whoa! What are you doing? Do you have any right to touch her? Also, it did cross my mind that he might hurt her. I just can't tell when Shunji is going to lose it. I think that episode 17 gave us a little more insight/compassion into Shunji's motivation and character. 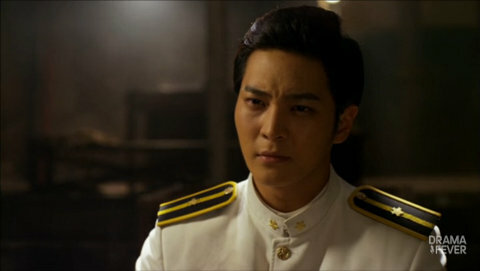 We already knew that he put on the uniform to save Mok Dan, but there is also the very real element that he feels like he has to avenge his hyung's death. Shunji and Kang To both have the same motivation in that regard, but Kang To is also beginning to embrace the bigger role of hero and freedom fighter for Korea - and it's helping to redeem him. Shunji on the other hand is slipping out of sanity (Park Ki Woong actually tweeted earlier this week that he's missing Teacher Shunji - you and me both). Ugh, just thinking about the scene where he stabs the freedom fighter in the heart repeatedly with the syringe needle *shivers* gives me chills! The freedom fighters are also violent, but they seem more controlled. 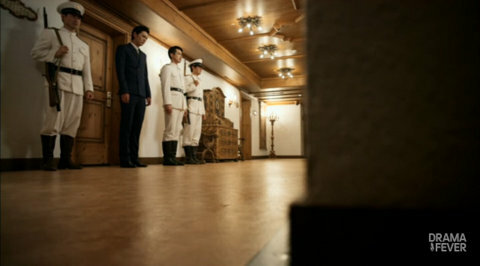 I really loved the scene where Dam Sa Ri's female comrade comes to execute Leader Jo. It was rather moving. I think it showed that despite the lengths to which they will go, there is some level of humanity there. bustered put it well: I liked that scene as well, and I am happy that it happened that way because I think I would have respected the freedom fighters less if she had killed Leader Jo. I don't like extremists and all that, so I found that moving. I am not such a fan of extremism myself. I think it can be really dangerous - even if there is moral and legal justification for it. I guess I understand freedom fighting (my country's history - I'm not American) had it's own fair share - and I get it - I guess I sometimes I struggle with the idea of the ends justify the means. And back to Shunji, I think he is having that problem - where does he choose to draw the line between having to be tough for the job, and also maintain enough humanity to be able to live with himself when all is said and done. 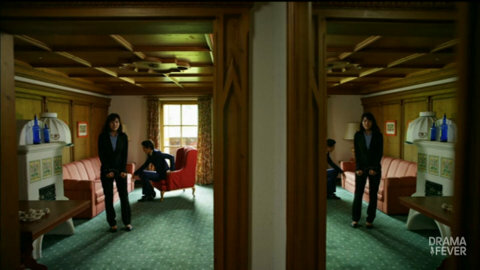 It was the question that Lee Min Ho's character in City Hunter was always struggling with. 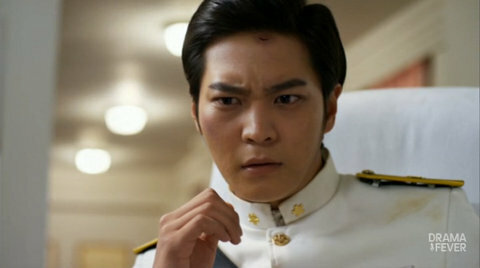 Shunji's whole relationship with Mok Dan shows that fine line - and how he's worried about - but I am afraid that he might no pull back, and in the end he might allow the evil persona to win. I hope there is redemption for him, oh I hope. Rie is another character who we go to see a little more of what makes her tick this episode. I really am not sure of her motivation. She's Korean, and yet she seems intent on punishing her mother country. If I remember correctly, she was part of the Yangban class forced to become a gisaeng - not so awesome, but we need to know more of her backstory before we can perhaps see her point of view. I am also really curious to see how her backstory, current motivation, and inner conflict of her Korean-Japanese identity will play into perhaps saving/betraying Gaksital. bustered also pointed out, "how Shunji is the only one with the guts not to take her as seriously as everyone else does, and that gets under his skin." And the ending! Wow, that water fight scene was just beautiful! And the soundtrack has been just spectacular - that kyrie while Mok Dan was waiting (and it was playing when Kang To was falling to the bottom of the lake after being chased by Shunji - many moons ago). And to quote bustered: SHE KNOWS!!! I wonder how she'll react since her reaction to finding out Kang-to's also the young master wasn't exactly positive. I'm glad this kind of cuts Mok Dan down from her honorable ways. I respect her, but not everyone, and especially not Kang-to, with all the things he's done, can afford to do awesome freedom fighting the straight and narrow way. Plus, he's a lot more effective at freedom fighting than she has been. She's honorable but also naive, and it's nice to see her fantastical ideals crushed. She believed that the young master was Gaksital, and now she realizes that they're both Kang-to, the cannibal who eats freedom fighters, and Gaksital. dewaanifordrama: That was a beautiful moment. 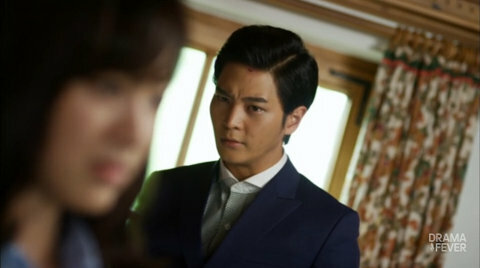 I really am curious to see how this helps Mok Dan to grow up a little, and how she is going to have to reconcile her "first love" Young, her hero-worship-love for Gaksital, and her hatred of Kang To - it is an interesting cocktail to say the least. bustered: Even though I can't wait for next Wednesday to come, (why Olympics, why?!?!) I'm glad that this episode was awesome. But just think of it! Next episode, she'll help him to that secret hut of his and then she'll nurse him back to health! Pretty please!!! 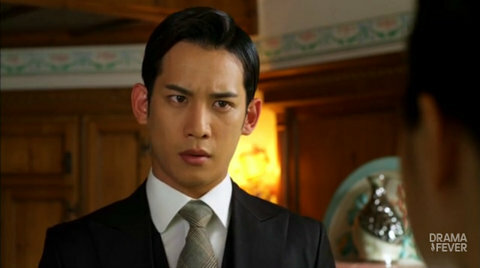 Oh...but what if he doesn't show up to work...ah Shunji. 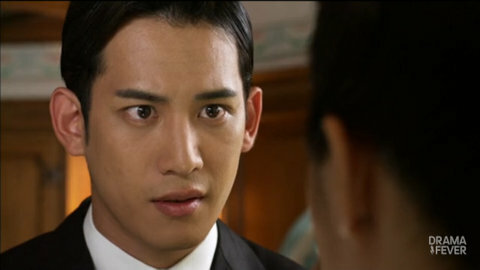 I'm pretty sure that Shunji is certain that Kang-to is Gaksital. Pretty sure...decently sure...almost sure. 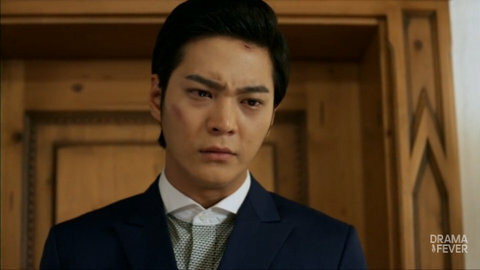 dewaanifordrama: I think that Shunji knows in his gut that Kang To is Gaksital - but he doesn't want to consciously embrace it because it means that all the rage, carnage, and desperate madness that's consumed him recently will have to be justified by his killing Gaksital (or trying to). It's like he's decided on this path, and to embrace his old self means he has to let go of that rage and revenge. I don't think he wants to loose all hold on his good self, but he's teetering on a fine line - and he might fall. I guess to tide us over until next week, I'll have to re-watch the episode and this gem of a fanvid. Your comment just made my day! I am glad that you liked the post ^_^ - I watched the trailer for ep. 18 after I had already posted this, and I almost died of happiness! I am so excited!